UTSA Jazz Ensemble. Photo courtesy of UTSA Music Dept. It came from the UTSA Recital Hall. It was loud, sharp and immense. Its skill uncompromised and a force to be reckoned with. Most importantly, it was funky. 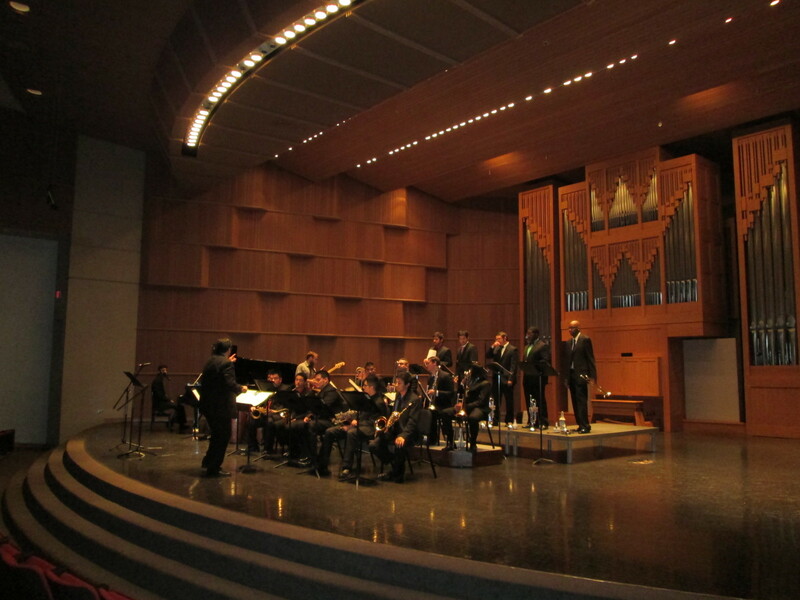 The UTSA Jazz Ensemble performed their second concert of the season on Nov. 8. Directed by Dr. Adrian Ruiz and Assistant Director Michael Steiner, this performance came a month after the ensemble’s first show, a tribute to the late Professor Morgan King. “We had three weeks to put the music together,” Ruiz told the audience. Seven songs were selected for the evening, ranging from classic big band and funk to reflective ballads. The opening piece was “None of Those Things,” arranged by Dan Torosian. 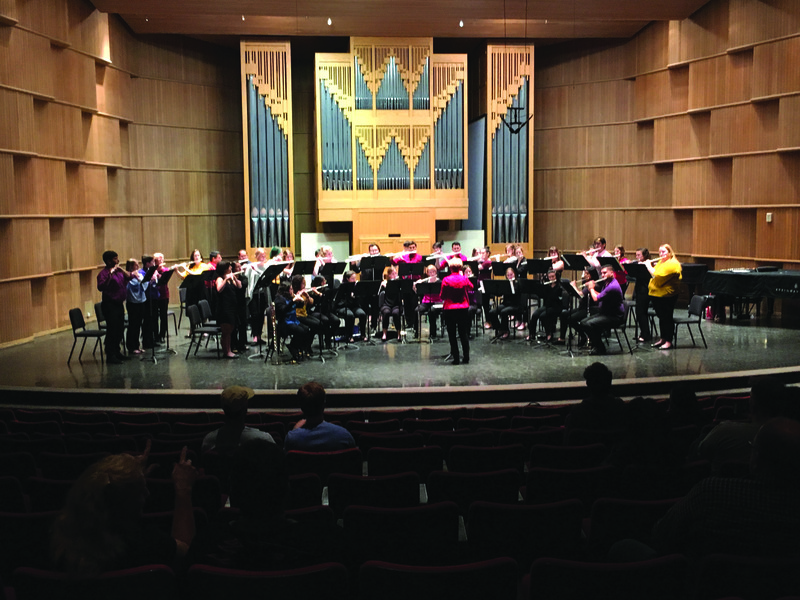 The composition was taken from another guitar arrangement by Dan Towney called “All the Things You Are.” It began with the entire ensemble striking a chord in unison. The melody ascended and descended through continuous strikes, ducking and dodging as it searched for a comfortable place to rest and catch its breath. The ride cymbal drove the song along as the trombone soloist attracted the entire audience with his impressive, full-bodied sound. After giving thanks to Steiner, Ruiz welcomed Roland Sandoval, the guest director for the evening. Following introductions, Sandoval set the scene for the next piece — one he described as a “jazz journey” and requested the audience to “picture [going down] a cobble street” through Spain. Steve Speigl’s “Cartegeña” took the audience back to a time long ago. A lone three-note piano melody began, accompanied by the hi-hat rapidly tapping along, creating a sense of hurriedness similar to horses pulling a carriage. The trumpets sustained each descending note, and danced with the saxophones. Congas accompanied the trombone soloist and the audience members all bobbed along to the guitar’s “twangs” and “chuks” that accompanied the saxophone. After the ensemble came to a bombastic halt, the lone piano melody steadily slowed down and faded into silence. Sandoval bowed and passed the microphone back to Ruiz. The director acknowledged Steiner for stepping in at the “11th hour” to fill in on trombone for a student who fell ill. Then Ruiz recognized Stephen Castor, the tenor saxophone soloist for the next piece – also by Steve Speigl – “Wendy.” As the slow, reflective ballad picked up the pace, the piece became a conversation between Castor and the rest of the jazz ensemble. Roselyn Rios sang alongside the ensemble for Myles Collins’ arrangement of “Night and Day” by Cole Porter. 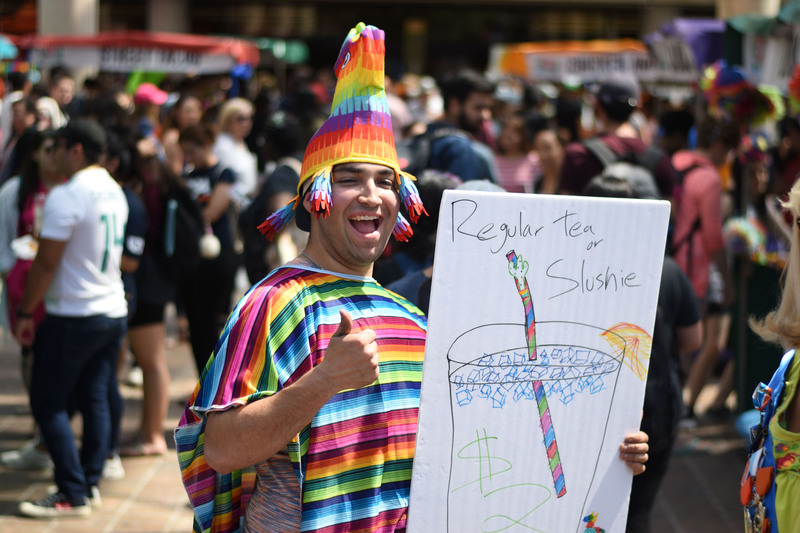 “Like the beat, beat, beat of the tom tom,” Rios sang. Steiner conducted the ensemble for their fifth piece, “Hullabaloo” by Alan Baylock. “We’re gonna have a little fun and go down to New Orleans,” Steiner chuckled. The audience immediately bobbed along to the thumping bass and foot-stomping drum beat as the horns and saxophones invited everyone to loosen up and place themselves in the middle of French Quarter fanfare. Jonny Espinoza’s dynamic voice crooned and resonated in Thad Jones’ “Smack Dab in the Middle,” before Ruiz gave his thanks to Department Chair Tracy Cowden. The ensemble made an explosive finish with the night’s feature arrangement of Randy Brecker’s “Some Skunk Funk.” Ruiz counted off, “A-one! Two! One, two, ready, go!” The drums hit and accompanied the ensembles’ ferocious runs. Anxious rhythms hurried the notes along with meticulous precision. Castor’s saxophone coolly announced itself after a beat of silence before passing the torch to Felix Cruz III on trumpet. The piano pressed hard chords behind the wailing horn. The bass guitar player’s fingers flew up and down the instrument’s neck before the drums broke into a fill. The congas pounded along with the quick “chuks” of the guitar. Intricate poly-rhythms and runs concluded the piece as the final note echoed off the walls. The UTSA Jazz Ensemble’s next performance will be at the 2018 Winterlude on Nov. 19, at 7:30 p.m. Admission is $10, and tickets are on sale now. For more information, please visit http://music.utsa.edu.com.